Out of all the questions we receive, there is one more ubiquitous than the rest: What is it about Chef Matsuhisa’s cuisine that makes it so delicious? Now, it is a very difficult endeavor to attach words to explain visceral experience, which is why Matsuhisa’s staff undergoes a rigorous training process to not only know the cuisine, but to understand it. Understanding and communicating the nuances of Chef Matsuhisa’s cuisine is an invaluable part of providing not only kokoro food – that is, food “from the heart” – but also kokoro service, to guests across Matsuhisa Colorado’s three locations: Aspen, Vail, and Denver. As Matsuhisa ambassadors, our staff must have a command of the food in order to translate experience into words, pointing guests towards the creation that best suits his/her palate, and therefore, maximizes the enjoyment of each bite. In the following posts, we will dive into the flavor profiles of some of Chef Matsuhisa’s signature dishes so that you – the reader – can become an ambassador of his cuisine, and help guide your friends and family through the menu the next time you are in one of our restaurants. 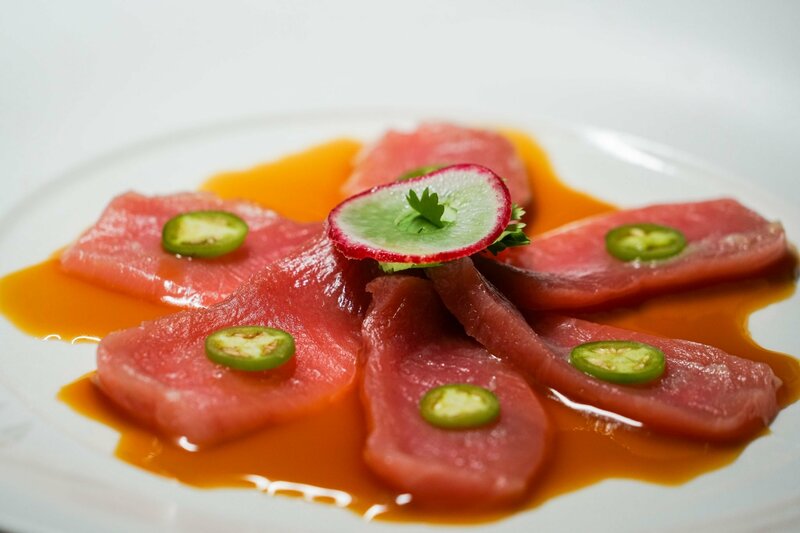 And where better to begin than Chef Matsuhisa’s most famous sashimi preparation: Yellowtail Sashimi with Jalapeno. Six pieces of yellowtail sashimi brushed with garlic puree, thinly sliced serrano pepper, bathed in yuzu-soy sauce and garnished with cilantro. So…why is it so delicious? 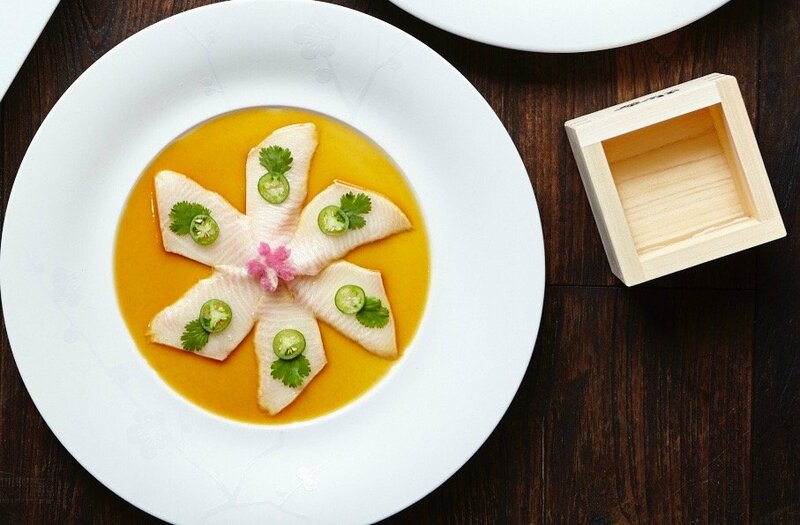 Yellowtail, or Hamachi, is a marbled, delicate fish, which goes well with citrus – in this case, yuzu, a uniquely powerful Japanese fruit. Yellowtail is also mild, so the soy complements the flavor, rather than adding to any inherent saltiness, while also bringing out a hint of sweetness in the protein. Next, a rub of garlic puree, and a paper-thin slice of serrano pepper, add a pop of heat that contrasts with the aforementioned salt, citrus, and mellow sweetness. Finally, aromatic cilantro is added to brighten the dish and lighten any intense spice from the serrano. Independently, each element holds its own beauty, but when united skillfully, they form a singular experience with many sensorial layers – a reoccurring theme in Chef Matsuhisa’s cuisine. For those of you familiar with this Matsuhisa Signature Sashimi Preparation, you can try it with a different protein to experience the subtle differences offered by other fish, such as Kanpachi (Amberjack), Bluefin Tuna, Wild Salmon, or Toro (tuna belly, pictured below). Alaskan Black Cod cured in Den Miso for 72 hours, broiled, then garnished with hajikami. 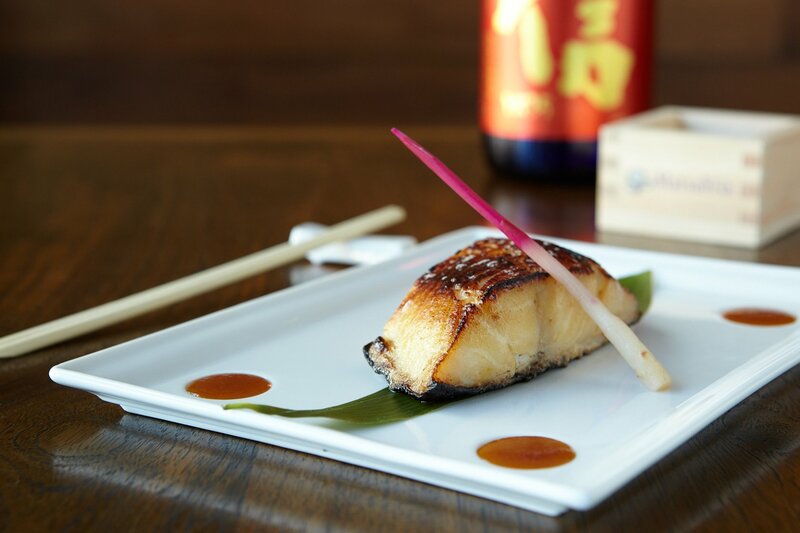 Black Cod with Miso is the most popular dish at Matsuhisa – and for good reason. Cod is a very accessible fish that can be enjoyed by any experienced fish-eater, as well as someone who rarely eats seafood. Matsuhisa serves Alaskan Cod, a Pacific fish that lives in colder water; thus, it is fattier, which is why it holds up to cooking, frying, and baking. By contrast, tuna is a warm-water, migratory fish, which is why it is so lean. Cod is a marbled protein that is easily cured in Chef Matsuhisa’s signature Den Miso. The process of curing is a molecular dance occurring within food, and is essential to deepening the flavor of this dish. Den Miso (sugar, mirin, sake, soy bean paste) marinates, drawing moisture from the fish while imparting flavor onto it. As for the garnish, the Hajikami is a sprout of a ginger, pickled and spicy, which juxtaposed to the sweet and saltiness of the cured Cod, adds a palette-cleansing acidity to finish off the experience. You are therefore dealing with the convergence of four major flavors in this one creation: saltiness (miso), sweet (sugar/mirin), sour and spice (ginger). Simple, yet complex at the same time. Squid cut to resemble pasta sautéed with clarified butter & garlic slices, asparagus and shimaji mushrooms, sprinkled with shichimi and deglazed with sake-soy. This is a soulful dish that comes with an anecdote from Chef Matsuhisa’s early days at the eponymous Beverly Hills location. Upon hearing the complaints of a disgruntled child expressing a distaste for seafood emanating from across the sushi bar, Chef Matsuhisa sliced up some squid in the shape of pasta shells, sautéed it with fresh vegetables in butter and garlic, and presented it to the child as pasta. It was only after the child had eaten it up and professed his delight did the chef tell him that what he was eating was indeed seafood! Japanese cuisine offers many earthy, umami flavors, which can be found in the Squid Pasta, and everything in a Matsuhisa kitchen is a reflection of Chef Matsuhisa’s Japanese heritage – history, moments, and memories manifesting as flavors. As progressive as the food seems, Chef Matsuhisa considers his cuisine simple because of where its soul lies: in the kitchens of Japanese mothers and grandmothers. The simplicity of the dish makes cultural sense, as well: quality vegetables in the stir-fry which is a reflection of determined knife-work and farming; quality soy and sake for deglazing, which ultimately allows for all the ingredients and flavors during prep to be included in the dish’s final flavor profile. The idea and execution combined yields earthy – umami – flavors. 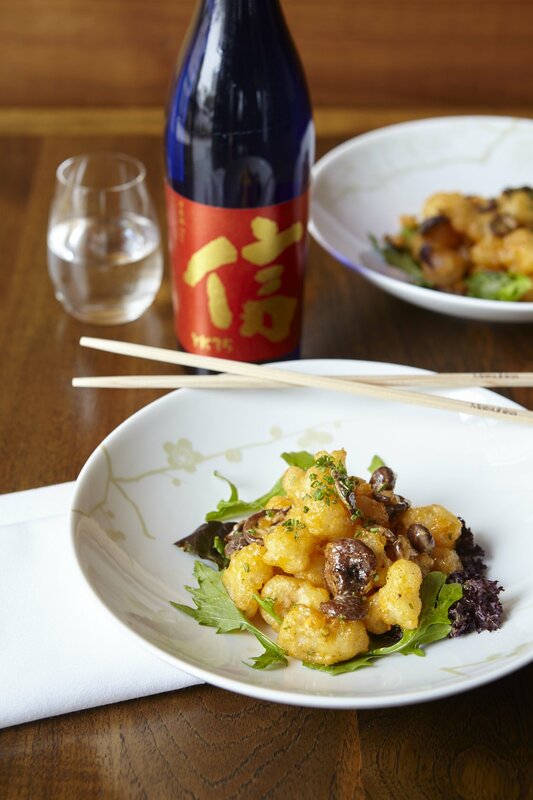 Rock shrimp tempura tossed in our creamy spicy sauce with yuzu juice and shiitake mushroom, garnished with micro-chives; or tossed in butter ponzu over mixed greens. There are layers of flavor in this dish that sometimes go unnoticed. First, we source premium Rock Shrimp from the Gulf of Mexico. Next, we batter and fry it, then toss it with Matsuhisa’s signature Creamy Spicy Sauce. We finish it with yuzu juice, and add shitake mushrooms to give the dish a meaty alternate texture, differentiating the toothiness of each bite while accenting the creamy-spicy-citrus with an earthy tasting note. The chive garnish gives it a bit of sharp spice to top it all off – once again, offering a dynamic merging of flavors. As for the Butter Ponzu sauce option to this dish, the butter rounds out the acidity of the rice-vinegar, offering a tangier, well-balanced flavor – crispy, yet light and elegant. Previous « What are the Best Sake Brands?